Nazi Germany maintained concentration camps (German: Konzentrationslager, KZ or KL) throughout the territories it controlled before and during the Second World War. The first Nazi camps were erected in Germany in March 1933 immediately after Hitler became Chancellor and his Nazi Party was given control of the police by Reich Interior Minister Wilhelm Frick and Prussian Acting Interior Minister Hermann Göring. Used to hold and torture political opponents and union organizers, the camps initially held around 45,000 prisoners. In 1933–1939, before the onset of war, most prisoners consisted of German Communists, Socialists, Social Democrats, Roma, Jehovah's Witnesses, homosexuals, and persons accused of 'asocial' or socially 'deviant' behavior by the Germans. Heinrich Himmler's Schutzstaffel (SS) took full control of the police and the concentration camps throughout Germany in 1934–35. Himmler expanded the role of the camps to hold so-called "racially undesirable elements", such as Jews, Gypsies/Romanis/Sintis, Serbs, Poles, disabled people, and criminals. The number of people in the camps, which had fallen to 7,500, grew again to 21,000 by the start of World War II and peaked at 715,000 in January 1945. Beginning in 1934 the concentration camps were administered by the Concentration Camps Inspectorate (CCI), which in 1942 was merged into SS-Wirtschafts-Verwaltungshauptamt, and they were guarded by SS-Totenkopfverbände (SS-TV). When the Nazis came to power in Germany, they quickly moved to suppress all real and potential opposition. The general public was intimidated by the arbitrary psychological terror that was used by the special courts (Sondergerichte). Especially during the first years of their existence when these courts "had a strong deterrent effect" against any form of political protest. The first camp in Germany, Dachau, was founded in March 1933. The press announcement said that "the first concentration camp is to be opened in Dachau with an accommodation for 5,000 people. All Communists and – where necessary – Reichsbanner and Social Democratic functionaries who endanger state security are to be concentrated there, as in the long run it is not possible to keep individual functionaries in the state prisons without overburdening these prisons." Dachau was the first regular concentration camp established by the German coalition government of National Socialist Workers' Party (Nazi Party) and the Nationalist People's Party (dissolved on 6 July 1933). Heinrich Himmler, then Chief of Police of Munich, officially described the camp as "the first concentration camp for political prisoners." On 26 June 1933, Himmler appointed Theodor Eicke commandant of Dachau, who in 1934 was also appointed the first Inspector of Concentration Camps (CCI). In addition, the remaining SA-run camps were taken over by the SS. Dachau served as both a prototype and a model for the other Nazi concentration camps. Almost every community in Germany had members who were taken there. The newspapers continuously reported on "the removal of the enemies of the Reich to concentration camps" making the general population more aware of their presence. There were jingles warning as early as 1935: "Dear God, make me dumb, that I may not come to Dachau." Between 1933 and the fall of Nazi Germany in 1945, more than 3.5 million Germans were forced to spend time in concentration camps and prisons for political reasons, and approximately 77,000 Germans were executed for one or another form of resistance by Special Courts, courts-martial, and the civil justice system. Many of these Germans had served in government, the military, or in civil positions, which enabled them to engage in subversion and conspiracy against the Nazis. After September 1939, with the beginning of the Second World War, concentration camps became places where millions of ordinary people were enslaved as part of the war effort, often starved, tortured and killed. During the war, new Nazi concentration camps for "undesirables" spread throughout the continent. According to statistics by the German Ministry of Justice, about 1,200 camps and subcamps were run in countries occupied by Nazi Germany, while the Jewish Virtual Library estimates that the number of Nazi camps was closer to 15,000 in all of occupied Europe and that many of these camps were run for a limited amount of time before they were closed. Camps were being created near the centers of dense populations, often focusing on areas with large communities of Jews, Polish intelligentsia, Communists or Romani. Since millions of Jews lived in pre-war Poland, most camps were located in the area of the General Government in occupied Poland, for logistical reasons. The location also allowed the Nazis to quickly remove the German Jews from within Germany proper. By 1940, the CCI came under the control of the Verwaltung und Wirtschaftshauptamt Hauptamt (VuWHA; Administration and Business office) which was set up under Oswald Pohl. Then in 1942, the CCI became Amt D (Office D) of the consolidated main office known as the SS-Wirtschafts-Verwaltungshauptamt (SS Economic and Administrative Department; WVHA) under Pohl. In 1942, the SS built a network of extermination camps to systematically kill millions of prisoners by gassing. The extermination camps (Vernichtungslager) and death camps (Todeslager) were camps whose primary function was genocide. The Nazis themselves distinguished the concentration camps from the extermination camps. The British intelligence service had information about the concentration camps, and in 1942 Jan Karski delivered a thorough eyewitness account to the government. The two largest groups of prisoners in the camps, both numbering in the millions, were the Polish Jews and the Soviet prisoners of war (POWs) held without trial or judicial process. There were also large numbers of Romani people, ethnic Poles, Serbs, political prisoners, homosexuals, people with disabilities, Jehovah's Witnesses, Catholic clergy, Eastern European intellectuals and others (including common criminals, as the Nazis declared). In addition, a small number of Western Allied aviators were sent to concentration camps as punishment for spying. Western Allied POWs who were Jews, or who were suspected of being Jews by the Nazis, were usually sent to ordinary POW camps; however, a small number of them were sent to concentration camps because of antisemitic policies. In most camps, prisoners were forced to wear identifying overalls with colored badges according to their categorization: red triangles for Communists and other political prisoners, green triangles for common criminals, pink triangles for homosexual men, purple triangles for Jehovah's Witnesses, black triangles for asocials and the "work shy", yellow triangle for Jews, and later the brown triangle for Romanis. On 31 July 1941 Hermann Göring gave written authorization to SS-Obergruppenführer Reinhard Heydrich, Chief of the Reich Main Security Office (RSHA), to prepare and submit a plan for a "total solution of the Jewish question" in territories under German control and to coordinate the participation of all involved government organisations. The resulting Generalplan Ost (General Plan for the East) called for deporting the population of occupied Eastern Europe and the Soviet Union to Siberia, for use as slave labour or to be murdered. Towards the end of the war, the camps became sites for medical experiments. Eugenics experiments, freezing prisoners to determine how downed pilots were affected by exposure, and experimental and lethal medicines were all tried at various camps. A cold water immersion experiments at Dachau concentration camp were performed by Sigmund Rascher. The lead editors of the Encyclopedia of Camps and Ghettos, 1933–1945 of the United States Holocaust Memorial Museum, Geoffrey Megargee and Martin Dean, cataloged some 42,500 Nazi ghettos and camps throughout Europe, spanning German-controlled areas from France to Russia and Germany itself, operating from 1933 to 1945. They estimate that 15 million to 20 million people died or were imprisoned in the sites. Some of the most notorious slave labour camps included a network of subcamps. Gross-Rosen had 100 subcamps, Auschwitz had 44 subcamps, Stutthof had 40 sub-camps set up contingently. Prisoners in these subcamps were dying from starvation, untreated disease and summary executions by the tens of thousands already since the beginning of war. The camps were liberated by the Allied forces between 1944 and 1945. The first major camp, Majdanek, was discovered by the advancing Soviets on July 23, 1944. Auschwitz was liberated, also by the Soviets, on January 27, 1945; Buchenwald by the Americans on April 11; Bergen-Belsen by the British on April 15; Dachau by the Americans on April 29; Ravensbrück by the Soviets on the same day; Mauthausen by the Americans on May 5; and Theresienstadt by the Soviets on May 8. Treblinka, Sobibór, and Bełżec were never liberated, but were destroyed by the Nazis in 1943. Colonel William W. Quinn of the U.S. 7th Army said of Dachau: "There our troops found sights, sounds, and stenches horrible beyond belief, cruelties so enormous as to be incomprehensible to the normal mind." In most of the camps discovered by the Soviets, almost all the prisoners had already been removed, leaving only a few thousand alive—7,000 inmates were found in Auschwitz, including 180 children who had been experimented on by doctors. Some 60,000 prisoners were discovered at Bergen-Belsen by the British 11th Armoured Division, 13,000 corpses lay unburied, and another 10,000 died from typhus or malnutrition over the following weeks. The British forced the remaining SS guards to gather up the corpses and place them in mass graves. Historians have divided the Nazi concentration camps into a series of major categories based on purpose, administrative structure, and inmate-population profiles. The system of camps preceded the onset of World War II by several years and evolved gradually. Early camps, usually without proper infrastructure, sprang up everywhere in Germany after Hitler became Chancellor in January 1933: rising "like mushrooms after the rain", Himmler recollected. These early camps, also called "Wild camps" because some were set up with little supervision from higher authorities, were overseen by Nazi paramilitaries, by political-police forces, and sometimes by local police authorities. They utilized any lockable larger space, for example: engine rooms, brewery floors, storage facilities, cellars, etc. State camps (e.g. Dachau, Oranienburg, Esterwegen) guarded by the SA; prototypes for the future SS concentration camps, with a total of 107,000 prisoners as early as 1935. Hostage camps (Geisellager), known also as police prison camps (for example: Sint-Michielsgestel and Haaren) where hostages were held and later killed in reprisal actions. Labor camps (Arbeitslager): concentration camps where interned captives had to perform hard physical labor under inhumane conditions and cruel treatment. Some of these were sub-camps, called "Outer Camps" (Aussenlager), built around a larger central camp (Stammlager), or served as "operational camps" established for a temporary need. POW camps (Kriegsgefangenen-Mannschafts-Stammlager / Stalag) a.k.a. Main Camps for Enlisted Prisoners of War: concentration camps where enlisted prisoners-of-war were held after capture. The inmates were usually assigned soon to nearby labor camps, (Arbeitskommandos), i.e. the Work Details. POW officers had their own camps (Offizierslager' / Oflag). Stalags were for Army prisoners, but specialized camps (Marinelager / Marlag ("Navy camps") and Marineinterniertenlager / Milag ("Merchant Marine Internment Camps")) existed for the other services. Kriegsgefangenen-Mannschafts-Stammlager Luftwaffe / Stalag Luft ("Air Forces Camps") were the only camps that detained both officers and non-commissioned personnel together. None of the categories are independent - one could classify many camps as a mixture of several of the above. All camps had some of the elements of an extermination camp, but systematic extermination of new arrivals by gas chambers only occurred in specialized camps. These were extermination camps, where all new-arrivals were simply killed—the "Aktion Reinhard" camps (Treblinka, Sobibór and Belzec), together with Chelmno. Two others ( Auschwitz and Majdanek) operated as combined concentration- and extermination-camps. Others like Maly Trostenets were at times classified[by whom?] as "minor extermination camps". Though most Nazi concentration and extermination camps were destroyed after the war, some of them were turned into permanent memorials, and museums. In Communist Poland, some camps such as Majdanek, Jaworzno, Potulice and Zgoda were used by the Soviet NKVD to hold German prisoners of war, suspected or confirmed Nazis and Nazi collaborators, anti-Communists and other political prisoners, as well as civilian members of the German-speaking, Silesian and Ukrainian ethnic minorities. Currently, there are memorials to the victims of both Nazi and communist camps at Potulice; they have helped to enable a German-Polish discussion on historical perceptions of World War II. In East Germany, the concentration camps at Buchenwald and Sachsenhausen were used for similar purposes. Dachau concentration camp was used as a detention centre for the arrested Nazis. ^ Jewish Virtual Library (2014). "Main Concentration Camps". The Holocaust: Concentration Camps. AICE. Retrieved 17 December 2014. ^ Evans 2003, pp. 344–345. ^ Evans 2005, p. 81. 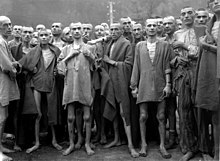 ^ Holocaust Encyclopedia, Nazi Camps. Introduction. United States Holocaust Memorial Museum. ^ Gumkowski, Janusz; Leszczynski, Kazimierz; Robert, Edward (translator) (1961). Hitler's Plans for Eastern Europe. Poland Under Nazi Occupation (First ed.). Polonia Pub. House. p. 219. ASIN B0006BXJZ6. Archived from the original (Paperback) on 9 April 2011. Retrieved 12 March 2014. at Wayback machine. ^ Evans 2005, pp. 87–90. ^ Evans 2005, p. 90. ^ Evans 2008, p. 367. ^ Andrew Szanajda "The restoration of justice in postwar Hesse, 1945–1949" p. 25 "In practice, it signified intimidating the public through arbitrary psychological terror, operating like the courts of the Inquisition." "The Sondergerichte had a strong deterrent effect during the first years of their operation, since their rapid and severe sentencing was feared." ^ a b c "Ein Konzentrationslager für politische Gefangene In der Nähe von Dachau". Münchner Neueste Nachrichten ("The Munich Latest News") (in German). The Holocaust History Project. 21 March 1933. Archived from the original on 6 May 2013. ^ McNab 2009, p. 137. ^ Janowitz, Morris (September 1946). "German Reactions to Nazi Atrocities". The American Journal of Sociology. The University of Chicago Press. 52 (Number 2): 141–146. doi:10.1086/219961. JSTOR 2770938. ^ Henry Maitles NEVER AGAIN! : A review of David Goldhagen, Hitlers Willing Executioners: Ordinary Germans and the Holocaust", further referenced to G. Almond, "The German Resistance Movement", Current History 10 (1946), pp. 409–527. It's actually about Daniel Goldhagen. ^ Producer, By Wayne Drash CNN.com Senior. "Army to honor soldiers enslaved by Nazis - CNN.com". www.cnn.com. ^ "List of concentration camps and their outposts" (in German). Federal Ministry of Justice and Consumer Protection. ^ a b Concentration Camp Listing Sourced from Van Eck, Ludo Le livre des Camps. Belgium: Editions Kritak; and Gilbert, Martin Atlas of the Holocaust. New York: William Morrow 1993 ISBN 0-688-12364-3. In this on-line site are published the names of 149 camps and 814 subcamps, organized by country. ^ "List of national socialist camps and detention sites 1933 - 1945". Germany - A Memorial. Bettina Sarnes, Holger Sarnes. So far 3600 sites are recorded on this website. ^ One of the best-known examples was the 168 British Commonwealth and U.S. aviators held for a time at Buchenwald concentration camp. (See: luvnbdy/secondwar/fact_sheets/pow Veterans Affairs Canada, 2006, "Prisoners of War in the Second World War" and National Museum of the USAF, "Allied Victims of the Holocaust" Archived 2014-02-23 at the Wayback Machine.) Two different reasons are suggested for this: the Nazis wanted to make an example of theTerrorflieger ("terror-instilling aviators"), or they classified the downed fliers as spies because they were out of uniform, carrying false papers, or both when apprehended. ^ a b c Friedlander, Henry (1995). The Origins of Nazi Genocide: From Euthanasia to the Final Solution. Chapel Hill: University of North Carolina Press. p. 144. ^ Robert L. Berger, M.D. (1990). "Nazi Science — The Dachau Hypothermia Experiments". The New England Journal of Medicine. 322 (20): 1435–1440. doi:10.1056/NEJM199005173222006. PMID 2184357. ^ a b Lichtblau, Eric (March 1, 2013). "The Holocaust Just Got More Shocking". The New York Times. Retrieved 27 June 2014. When the research began in 2000, Dr. Megargee said he expected to find perhaps 7,000 Nazi camps and ghettos, based on postwar estimates. But the numbers kept climbing — first to 11,500, then 20,000, then 30,000, and now 42,500. For the map of more that 1,000 locations, see: Map of Ghettos for Jews in Eastern Europe. The New York Times. Source: USHMM. ^ "Historia KL Gross-Rosen". Gross-Rosen Museum. 2014. Retrieved 19 February 2014. ^ a b Auschwitz-Birkenau State Museum (2014), Podobozy KL Auschwitz (Subcamps of KL Auschwitz). Retrieved 6 October 2014. ^ "Stutthof, the first Nazi concentration camp outside Germany". Jewishgen.org. Retrieved 2013-01-21. ^ "Stutthof (Sztutowo): Full Listing of Camps, Poland" (Introduction). Jewish Virtual Library. Retrieved 2014-10-07. Source: "Atlas of the Holocaust" by Martin Gilbert (1982). ^ Marek Przybyszewski, IBH Opracowania - Działdowo jako centrum administracyjne ziemi sasińskiej (Działdowo as centre of local administration). Internet Archive, 22 October 2010. ^ Stone, Dan G.; Wood, Angela (2007). Holocaust: The events and their impact on real people, in conjunction with the USC Shoah Foundation Institute for Visual History and Education. p. 144. ISBN 978-0-7566-2535-1. ^ Holocaust: The events and their impact on real people, DK Publishing in conjunction with the USC Shoah Foundation Institute for Visual History and Education, p. 146. ^ Holocaust: The events and their impact on real people, DK Publishing in conjunction with the USC Shoah Foundation Institute for Visual History and Education, p. 145. ^ "Bergen-Belsen", United States Holocaust Memorial Museum. ^ Wiesel, Elie. After the Darkness: Reflections on the Holocaust, Schocken Books, p. 41. ^ Wachsmann 2015, p. 84. ^ Wachsmann 2015, pp. 38–45. ^ Federal Archives (2010). "Police prison Camps and Police Prisons in the Occupied Territories". Retrieved August 13, 2015. ^ "One place, different memories". Geschichtswerkstatt Europa. 2010. Archived from the original on July 16, 2011. Retrieved July 26, 2012. ^ "Ausstellung der KZ-Gedenkstätte Dachau". Dachau Concentration Camp Memorial Site (in German). Archived from the original on 18 January 2012. Wikimedia Commons has media related to Nazi concentration camps. This page was last edited on 12 April 2019, at 20:57 (UTC).